They say scrapbooking is a great way to cherish your favorite memories and organize photos that are lying around your home. It sounded to me like a lot of hard work. If I wanted to capture memories and transport myself to another place, I’d meet an old friend at a bar. But I knew there was a good reason why scrapbooking has grown from a homegrown pastime into a thriving multi-billion dollar industry. To enthusiasts like Andrea, scrapbooking is more than just a hobby. It’s a religion. Scrapbookers (or “scrappers” as they’re known in inner circles) are a devout group. There are lots of products on the market to tempt the faithful, including paper, cardstock, embellishments, stickers, stamps and stamp pads. Andrea recently used a colorful ensemble of paper, ribbon, and fabric flowers to make a beautiful mini-scrapbook of her daughter’s 6th birthday party that rivaled my wedding album. To me, the sheer number of available supplies seems overwhelming. Andrea assured me that a beginner like me could buy a kit containing step-by-step instructions on how to get started. Then she rattled off enough kit companies to make my head spin. That’s when I noticed the bandage on her middle finger and discovered that scrappers get to use tools like X-Acto knives, rotary cutters, and tape guns (Andrea had intended to use the X-Acto knife to crop a photo, not her cuticle). Suddenly, scrapping sounded dangerously fun. Scrappers use cool terms such as “cropping” (to trim your photos to improve composition) and phrases such as, “I was gone overnight for a crop.” (A crop is a gathering of women to enjoy the company of friends and work on their scrapbooks). Some scrappers attend conferences, retreats, and even cruises with all-you-can scrap buffets. Tools such as cutters, corers, scissors and punches have become big business in the scrapbooking industry. Andrea scrapes and saves for high-end, state-of-the-art equipment. She recently splurged on a $500 high-quality color printer that has more innovative features than a NASA Space Shuttle. She said it has brilliant colors, sharp edges, and great skin tones and provides everything you need short of Aqua Net hairspray to create a perfect portrait. I used to think Andrea was full of scrap. But seeing her beautiful scrapbooks has inspired me to take time this winter to unearth my photographs of family and friends that are stuffed in drawers, in shoe boxes and under the bed and organize them into a memory-book to preserve my personal and family history. I might even find myself transported to another place—that’s not my therapist’s couch. ← Does Your Medicine Cabinet Need a Makeover? I don’t have a crafty bone in my body, but scrap booking does seem like a good creative outlet. Wish you success with yours. I love the “all you can scrap buffet”. You always put a smile on my face. Thanks. I hear you. I’m only crafty in a mischievous way. Thanks for putting a smile on my face too. I did the same thing with stamping. I ended up giving my supplies to my daughters, who made lots of artwork with words like “happy birthday” and “recipes” stamped on them. 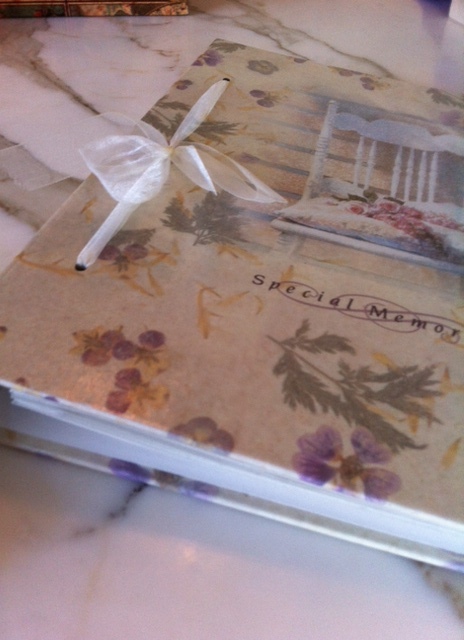 I am always envious when I see the gorgeous albums, but then the thought of all that work!! If you try this post pictures, we would love to see! I will–if I’m not too embarrassed by the finished product! Scrapbooking sounds like a fun creative outlet, but I probably should finish my second kid’s baby book first. I’m a little behind since she is in 1st grade. This was quite informative and cruises? Really? LOL! It’s so easy to fall behind! That works too! Whether scrapbooks or flash drives, it’s nice to preserve memories to have something to look back on. Thanks for your inspiring words! Ha, Ha! It is cheaper than therapy! However, I’ve not done scrapbooking exactly. I collage which is similar, I think. Still art supplies cost a lot, which is why I try to work with found objects a lot. I’ve always wanted to try scrapbooking, but now that I’m living in South America, the supplies would have to shipped in and would cost a small fortune–maybe even a large one. Sounds like you’ve got a lot of great material to work with, as far as recycled materials and capturing your exotic surroundings in Ecuador! Oh, no. I think I may have lost my comment. Let’s try again. You’re right–scrapbooking IS probably cheaper than therapy. I’ve not tried it exactly, but do collage instead. Shipping in the supplies for scrapbooking to South America might cost a small fortune. I’ve only made one – but would be embarrassed for a group of legit croppers to see it! I have to admit all those decorative little doodads give me the same anxious feeling that a pile of lego pieces do! Yes, the doodad choices alone can be paralyzing! I recently got sucked into the scrapbooking aisle at Hobby Lobby and emerged 40 bucks poorer but satisfied with the embellishments that allowed me to make personalized cards for a friend. It was therapeutic to focus on simply applying sticker borders to a cardboard edge instead of dwelling on work issues. I like the idea of personalized cards. I think the effort in creating the card is more meaningful than any pre-written Hallmark words. Scrapbooking strikes me as gender fixed. In my minds eye, I scoured all the men and boys I ever knew, going back to kindergarden and not one would admit to getter closer than a ten foot pole to scrapperings. So, I guess I have no comment except don’t get glued to the subject. Scrapbooking and gender–a sticky subject indeed! I used to scrap book without any of the crafter’s aids. What fun it would be to start again. The problem is there are no more hold-in-your-hand photos. They are mostly stored in computer clouds somewhere. True, everything is in the cloud! Scrappers are very cult-like and I’ve stayed clear of the Cricuts and related paraphernalia because I know I would get totally addicted. I’ll save my shilling for bread, milk and eggs. Plus, the Hobby Lobby parking lot is like the Demolition Derby with scrappers bolting for sales adding a new dimension to “scrap” metal. LOL! I’m guessing you live near funny sister because you both mentioned Hobby Lobby, which I’ve never heard of here in NJ. I was wrong, Terri– it was a different blogger who mentioned Hobby Lobby along with you. Another thing–I researched the store because I’d never heard of it. I was interested to learn that the store is “operated in a manner consistent with biblical principles.” I guess those scrappers really are a devout bunch! Ha! It’s so true. The store is even closed on Sunday which may explain the hysteria the other 6 days of the week. Actually, it’s a pretty cool store. Like Michaels only bigger. I have a friend who’s a scrapper, too. Her books are works of art that she spends hours creating. While I admire her dedication and her creativity, I’m afraid I will run out of finger tips to sacrifice with the X-acto knife before I run out of pictures to crop. Good luck on your project. LOL. In that case, digital albums are for you, hands down! Your right, it is a big commitment. So far I have a goal. I still have to achieve it! I admire you for starting two scrapbooks. Rather than thinking of them as unfinished, consider them works in progress! LOL! I suppose are blogs too can be viewed as virtual scrapbooks for our kids some day. I came to scrapping late. My son had to make a memory book as an English project in high school, so naturally he enlisted my help. I mean, I’m the mom, right? The one with the English degree, the “creative” one. I found it rather fascinating, and it did appeal to my creative side. Thereafter, I made one each year for him. They’re all safely tucked away, now that he’s finished with college, but I’m saving them for him. One day, he’s going to appreciate a stroll down Memory Lane! What a lucky son you have, Debbie. I bet he will cherish them. Have fun capturing all those memories! I’ve been contemplating on what to do with all the photos I have stuffed in boxes, drawers and worn-out photo albums. Scrapping them may be fun, but a lot of work considering all the photos I have. so that we can take a stole down memory lane at any given time. Love the idea of mixing the photos with music. Sounds awesome. Enjoy! The thought of getting all those pictures together at one time is daunting.The organizing them and (gasp!) putting them into a scrapbook is terrifying. Couldn’t I simply tell everyone that there was a fire in our house and strangely, only the photographs were destroyed…nothing else was touched by flames or smoke.